Studio 'J' offers piano lessons for children, young adults and adults. We start at your current level, whether beginner or intermediate. Your course of study can be tailored to your goals and musical interests. Methods are tested and successful. Materials are by such authors as Bastien, Alfred, Faber & Thompson. Students take their lessons on a Decker Brothers Grand Piano, or on a Yamaha Grand Piano Keyboard. 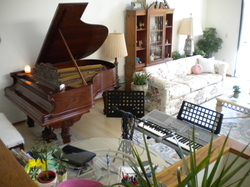 In addition to the on-site lesson time at the studio, it is recommended that students have a keyboard for practice at home. Each student is provided a Lesson Plan Book, with information inside, for use in weekly directions and practice.